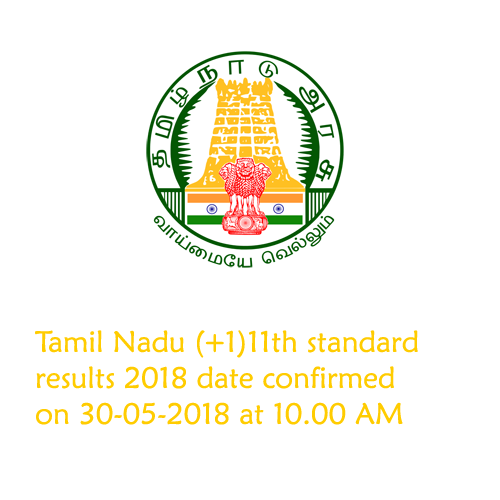 Tamil Nadu Government has announced 11th standard result (+1 results) 2018 date as 30th of may 2018 at 10.00 AM. According to Tamil Nadu Education Department (Tamilnadu Pallikalvi Thurai) official confirmation TN 11th(Plus One) Results 2018 will be published on government Official Website www.tnresults.nic.in at 10.00 AM on 30-05-2018. Tamil Nadu State 11th class exams were conducted by the Tamil Nadu Directorate of Government Education(TNDGE) from 07-03-2018 to 16-04-2018. Students can get their result immediate through online at www.tnresults.nic.in by entering examination register number and date of birth.